Beginning to Connect the Dots — Complex Trauma and Autism – trauma. stress. autism. I recently did some initial training in Trauma Center Trauma-Sensitive Yoga (TCTSY). I opted to do the online training and the in-person 20-hour training. Additionally, as part of my prep for the course, I finally made it through Judith Herman’s “Trauma and Recovery” and am about half-way through Bessel van der Kolk’s “The Body Keeps Score.” I’m not sure why it has taken me so long to get around to these two primary texts in trauma studies, but I’m glad I am finally digging in. Long ago, I was trained in noticing signs of abuse in children. It was part of me being a mandatory reporter for many years. In my early 30s, I also read a lot about the early signs of childhood trauma while I was processing my own traumatic experiences. When I started to really dig deep into reading about autism following our first child’s diagnosis, I could not help but notice some overlap. How had the similarities never come so clearly into focus for me before? That epiphany came and went and got buried beneath the last few years of parenting demands and life. As I looked over this Figure for my TCTSY training, I just kept thinking over and over again, “Whoa! That’s so autistic!” And thus here we are. Why have I made so many highlights?? Well, I highlighted the impacts I believe we also experience within the autism spectrum. These experiences are often framed slightly differently in autism, but my gut says that there is something fundamentally similar despite the differences in linguistic dressing. Many of these experiences are not currently considered a central part of the conceptualization of autism because autism is still being framed by the gatekeepers as primarily and fundamentally a social communication disability. However, research on autism and the lived experiences of autistic people encompass those things I have highlighted above. Further, I may have failed to highlight something on the list that I actually should have included but simply am not presently aware of its inclusion in autistic experience. For example, recent research has addressed the prevalence of eating disorders in autistic girls and women. This might mean that disturbances of body image are also experienced. It might not. I’m not aware of whether disturbances of body image are widely experienced among autistic persons. I can say that I as an autistic person have experienced disturbances of body image, but I don’t know about others so I left this one off my highlighted list for now. I will draw your attention to a few things from that document to function as examples. First, we can frame a child’s “intrusive touching” as an “unusual social initiation” as is done for autism or we could frame that as “problems with boundaries” as is done for complex trauma. Second, we could frame a child’s failure to initiate sharing of interests and emotions or only socially initiating to get help as indicative of “abnormal social approach” or “deficits in social-emotional reciprocity” as is the frame with autism or as “social isolation” or “interpersonal difficulties” or maybe even as “distrust and suspiciousness” as is the frame with complex trauma. I would be fascinated to see a study on inter-rater reliability and caregiver-report variability that involved evaluating young children previously diagnosed with some type of developmental trauma and children previously diagnosed with autism. What if the caregivers are not involved at all in the evaluation process? What if they are? How much does the caregiver’s word choice and framing of what they see change the final diagnosis? Would a clinician specialized in complex trauma see more complex trauma than autism? Would a clinician specialized in autism see more autism than complex trauma? And what would happen if we were to do imaging studies on the children’s neurological function, heart rate variability studies, tests on cortisol or other biomarkers of chronic stress? What if… and this is me out on a limb here… what if both are, at least in some autistic phenotypes, on a spectrum of stress-response system injuries? I will come back to this soon to add a list of additional suggested reading. 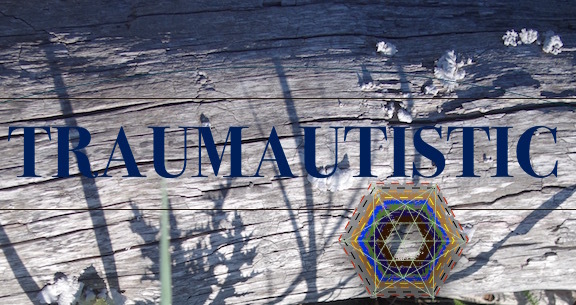 I would ideally like to gather a list of citations to articles I’ve previously read that line up autistic experiences with the Figure above on complex trauma domains. I am going to publish this without that list, but I will work on it and come back to edit when I am able.